From all the courses from this huge project, the best one is located in the campus of Capitol Hill, in the city of Prattville. Apart from its closeness to Montgomery, what makes this place special is the Alabama River flowing in the South, and giving some spectacular views to the three 18-hole courses the facility has. From the three of them, our chosen one is the “Judge”. This spectacular course is one of the longest and challenging of the whole trail, and water comes into play in fourteen holes. The opening hole already tells you what you are about to experience: a stunning downhill par 4 from a dramatic elevated tee, where you can enjoy some exquisite views of the river on the right side. However, do not get too abstracted with the landscape: in front of you there’s a difficult shot, where the lack of accuracy will punish you harshly, with not only the river, but a deep forest to the left and a huge bunker protecting the front side of the peninsula green. Check also the 6th hole: an intimidating par 3 to a big island green, where the wind could make your shot accidentally go diving to the Alabama River. Fees for the three courses at Capitol Hill starts at $65 plus taxes. However, make sure of calling beforehand in order to check availability and special prices. This course opened in 2003 and was designed by golf course architects Dr Michael Hurdzan and Dana Fry. The best thing you will find here: solitude. Located in the city of Sylacauga, it is surrounded by the Talladega National Forest, with the natural beauty that comes with it. Apart from this fact, this wild course has been used to research and study turf grass since its opening, which has led to have some of the best conditions in the State. There are a huge number of great holes here, but the signature one is the 5th: a par 3 with the biggest green of the course, which plays from an elevated tee where you can enjoy some spectacular views of the forest. Another great one is the also par 3 17th, a one-shotter that plays downhill over the river to a green at the other side. But not everything is golf in FarmLinks. For those interested in fishing or hunting, this property also count with instructors that will guide you and help you in whatever you need. Kiva Dunes is located in Gulf Shores, a coastal city in the south of Alabama, almost in the border with Florida. This links-style course was designed by Jim Edgemon together with the former U.S Open champion Jerry Pate, who created a fun track playable for everybody, with some sand dunes, swamps and ponds, all of it in a great location, close to the beach (Fagan, s.f.). Being practically a flat course, the trees limiting the course area do not let you see the sea, however, you can smell it and feel its closeness at every hole. This course is somehow the opposite as the other two seen before. While the tops of our list are pure wildness, seclusion and elevation changes, Kiva Dunes is more a resort-experience, where in some holes you can see some buildings from the surroundings, and where you are playing a links style flat course. Apart from these appreciations, the course is perfectly maintained as well. The signature hole here may be the 9th: a great par 4 to finish the front nine, with a fantastic approach shot over a pond. Apart from golf, the resort at Kiva Dunes offers everything you can expect in a touristic attraction like this one: luxurious accommodations, restaurants, a beach club with pools, massaging and other activities and the possibility of organising events. In their website, they affirm to have “dynamic prices”, but do not give any clues about the numbers. However, checking in some golf blogs, you can see that people have payed around $100 during weekends (WiscoGolfAddict, s.f.). The best option is to check their availability and rates by phone. We go back to the RTJ Trail, this time to a different location: Muscle Shoals, located in the north of Alabama, practically touching the Tennessee River. This place counts with two professional 18-hole courses, The Fighting Joe and the Schoolmaster. Our pick here is the former. Opened in 2004, Robert Trent Jones designed a long – very long- course, surpassing the 8000 yards. This bucolic track makes you feel the beauty and relaxation of nature, while offering challenging and fun holes. The signature hole here is said to be the par 5 17th, which plays to a green protected by five bunkers and a lagoon. However, there are other fantastic holes, such as the par 3s: the 5th, which plays downhill to a peninsula green surrounded by water; the 9th, which plays to an island green; or the 13th, a beautiful one shotter with water on the right side. Rates here are the same as in the other RTJ Trail courses, starting at $65 plus taxes. Another fantastic location of the extensive RTJ Golf Trail is the Grand National, situated eastern city of Opelika. 54 stunning holes which play alongside Lake Saugahatchee, in three spectacular courses: The Lake, The Links and The Short Course. The best one for us is the Lake one, not far ahead the Links. A great characteristic of this course is that twelve out of its 18 holes play along the Lake, giving the course some breath-taking views. The most memorable hole here has to be the par 3 15th: 230 yards to an island green where accuracy and club selection are essential. Apart from this one, check out the 12th, a par 5 along the lake that will tempt you to start taking pictures and forget about the round. Following its sister course, the Links offers a great alternative for those visiting the Grand National in Opelika. The longest of the three courses is for some one of the best, if not the best one course of the whole Trail. One thing is for sure: it counts with one of the bests finishing hole of the 26 courses designed by Robert Trent Jones. This croissant-shaped par 4 offers some spectacular views of the lake, while having to play a tee shot to a fairway with a swamp to its left and a big bunker to its right. Apart from this hole, check out the 4th, a challenging par 4 with a dogleg to the left; or the par 3 9th, playing to a peninsula green. Another one of the RTJ Trail! This time we travel to the city of Hoover, where we find the fifth longest golf course in the whole world, with 8191 yards, located in the Ross Bridge Resort & Spa. Fortunately, six sets of tees offers most players some chances of having fun in this stunning course. Opened in 2005, Ross Bridge counts with two lakes and an impressive waterfall. Another characteristic of this course is the wideness of its fairways and greens, what makes it one of the most forgiving courses of the Trail. There are a lot of memorable holes here. From the par 3s, we stay with the first one, the 4th: a one-shotter over a lake where right club selection is vital. From the par 4s, we stay with the 9th, playing along a lake to the left, to a well-protected green with a fantastic waterfall. Finally, from the par 5s, we choose the 13th, downhill and shorter than it may seem at first glance. The RTJ Trail Cambrian Ridge is located in Greenville, in the central-south area of Alabama. This facility counts with four 9-hole courses: Canyon, Loblolly, Sherling and the Short Course. From this four, the recommendation is playing the 18 holes combining Sherling and Canyon. Talking about the Canyon, this course was built on an old hunting area, and it is the most challenging of the four. Its rugged terrain, dramatic elevation changes and blind shots that will put your faith to test. However, it counts with a lot of elevated tee shots, so you can see where you getting at, at least at the beginning of the hole! The Sherling is the most picturesque one, with some stunning holes, ending up in a bunker-less uphill par 4. Apart from this one, the most beautiful holes may be the par 3 4th or the par 4 5th. We leave the RTJ Trail for a moment to find this great course, designed by Jerry Pate in 1999 and located in Oneonta, a 45 minutes-drive to the north of Birmingham. Nestled in the foothills of the Appalachian Mountains, this course combines elevation changes, meandering streams and a beautiful landscape melts in a fantastic way, in order to make any golfer truly enjoy the greatness of this sport. Its seclusion will make you feel you are alone in the woods, where the sounds of nature will make you focus completely in your next shot. The last position of our top-10 list goes for another RTJ Trail golf facility, Oxmoor Valley. 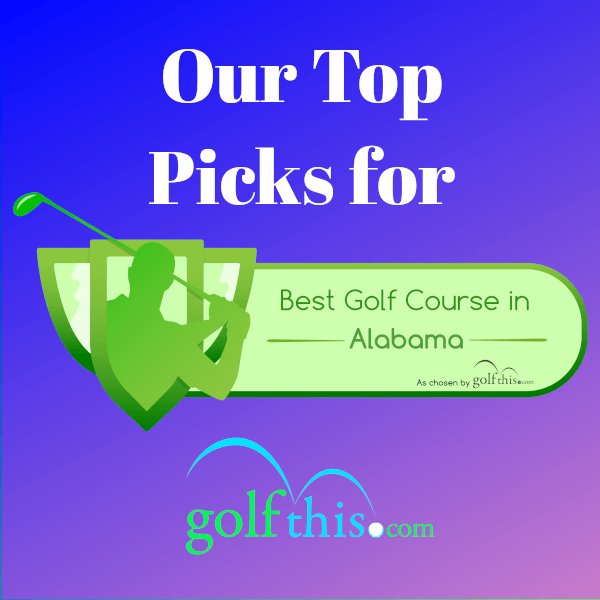 Located in Birmingham, the biggest city of Alabama, this location counts with 54 holes in total, throughout three different courses: The Ridge, The Valley and the Short Course, of which the Ridge is the signature one. This scenic course plays with lots of dramatic elevation changes, lots of forest and some of the best par 5s in the whole Trail, featuring crazily undulating fairways. The 3rd hole will leave you speechless: a par 5 with a pond in the middle of the fairway, with a green on top of some rock terraces which is deeper than it seems. Here ends our top-ten ranking for the best public courses of Alabama. As we have already seen, all of them are unique, and most of the times which one is better will be more a matter of opinion. Take your pick, play and then tell us how it went!